Winter is a special season. That's why a preschool winter theme is so much fun for children. *Many of the following activities do not involve real snow... so don't feel these activities are out of your reach should you live in a warmer climate. For those who do live in snow covered areas, don't forget the basics. Snowman building, sledding, building snow forts... these are the memory makers for children. Oh... and don't forget warm hot chocolate with mini-marshmallows. 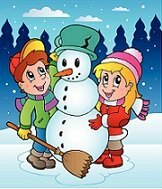 *You could also plan a preschool winter theme during the summer months. It may just help everyone feel a little cooler. Have a box ready with an assortment of hats, mittens, scarves, plastic carrots for noses, several buttons for the mouth, and charcoal or rocks for eyes. Then, when the snow comes that is sticky and just right for snowman building … you'll be ready. Use pieces of waxed paper under your feet to create an imaginary frozen pond. This works well for "gliding" across both carpet and regular flooring. Just make sure that the children understand that gliding is a slow movement, otherwise they may get too boisterous for this activity. It's not a preschool winter theme without a snowball fight. Wad up pieces of paper for an indoor snowball fight. Make sure there are a lot of "snowballs". I planned this activity for just before snack time since the lure of a snack made the children more willing to pick up the paper when the activity was over. Set up a "net". We used chairs with a sheet draped over them. Divide the children into two sides. Use several white balloons and let them try to keep the "snow" from falling to the ground by batting the balloons over to the other side. Decorate yourselves and some sleds and go walking through your neighborhood. Catch snowflakes on black paper (make sure the paper is cold first). Have magnifying glasses handy. Have a scavenger hunt to find as many white items as possible. Blow bubbles outside when it's cold and see what happens. If it is below 32 degrees, the bubbles will form crystals (the children will be able to see this happen), take on the appearance of a crystal ball and will shatter like glass. Go outside, lay in the snow and move both your arms and legs back and forth as wide as you can. Stand up to see the angel imprint. THEN...using spray bottles filled with water and a few drops of food coloring, spray paint your angels in a variety of colors. Fill a bucket with very cold water. Have a child momentarily place his hand in the bucket. Place some Crisco in a plastic bag, and spread it around. Place another plastic bag inside the Crisco bag. Have the child place their hand inside the double bag, and again place their hand in the cold water bucket. It will not be near as cold since the Crisco acts like a layer of fat.